A high-end, secluded sanctuary was the objective for this modern interior in San Francisco. Designed by the New York-based interior designer, Decor Aid. The client was an established developer in the Bay Area in search of a new look for a new home. The focus of the design was to enhance the existing furniture and overall sophisticated aesthetic of the space and to fuse the old elements with the new to create a warm and welcoming environment to call home. The living room was revitalized by Decor Aid with several new furniture additions and refined accents that added color and texture to the interior. The balance of the space also had to be perfected with object placement. Each sculptural piece that was brought home incorporates a different material, adding further layers of visual interest in this contemporary San Francisco interior. The living area is one of the largest rooms in the home. To keep the living area cool and comfortable, items were sourced with a focus on rich, vibrant colors. 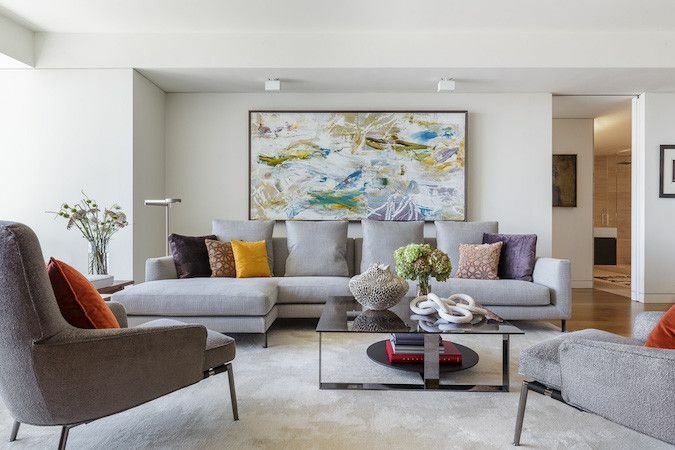 Pieces like pillows and art pulled from the client’s daring, non-representational collection added the perfect palette to the interior. Hues of burnt sienna, yellow and cool lilac make up a sophisticated color palette where cool grays and creams are the base. The end result is a warm space where color is built into the design. Every detail was thought about in the design of this Bay Area residence. Decor Aid sought to marry the painterly piece of art behind the sectional in the living room with some new elements that were in the home. Accessories were chosen to mimic the patterns and shapes in the composition. Various textures were utilized to add some organic, natural arrangements to the living space and make it feel more relaxed. Pieces like the organic shell vase and sculptural knot are reflective of the many unique accessories that can be found in the home's decor. Off of the living area, a separate room has been carved out in the space. It's unique in an open plan floor plan to see a room such as this. An entertainment area perfect for watching television and movies on a large screen. To amplify sound in the space, the entertainment room features wood-clad walls. The effect is both warm and inviting, as well as perfectly designed to resonate sound in the entertainment area of the home. Beyond the plush upholstered chairs of the home's living area, and the wood clad walls of the entertainment area, one enters the kitchen that's designed all in white. Decked out in a stark shade, the kitchen is a thoroughly modern environment. A marble kitchen island has room for seating at the bar, where stools are upholstered in white leather. Above the island a halo chandelier hangs adding lighting to the space. The kitchen cabinetry is sleek and flush with row upon row of white cabinets, perfect for storage. Plush materials and earthy colors rein in the home's master bedroom. The room has been designed to feel chic and masculine. The design emphasizes the rich, wood tones in the room that make up an expansive headboard where side tables are built in. Atop the bedside tables, the designer has added curvilinear table lamps to soften the sharp lines of the furnishings in the bedroom. For additional softness, a range of textiles have been added to the bedroom. A colorful mix of throw pillows completes the bed vignette, while an upholstered gray chair adds more soft texture to the bedroom's design. The result is a masculine, yet comfortable bedroom environment that makes a perfect retreat for the homeowner. A clean master bathroom palette was embellished with a stylish area rug. The stony gray, black and white rug brings pattern to the bathroom floor. Above a bench that's perfect for getting dressed, a painting hangs above, the only real dose of color in the space. Everything else in the bathroom is sculptural in nature, from the egg soaking tub to the streamlined vanity. It's a truly minimalist space designed to be a relaxing retreat for Bay Area living.